Jo has been a film programmer at the London Filmmakers’ Co-op and a reviewer, writing for City Limits, the Guardian and Sight & Sound. She has taught Film Studies at Leicester Poly, UEL and Kingsway College. She currently works for Flicks in the Sticks and Borderlines Film Festival in Herefordshire and Shropshire. We are pleased to have Jo on our competition jury and introducing this showing of her film. A rare chance to see a documentary about the Super 8 scene, first shown on Channel 4 TV in 1986. Eight millimetre film is not a phenomenon which is confined to living-room wallls; it may surprise viewers to learn just how often it appears on their television and cinema screens. 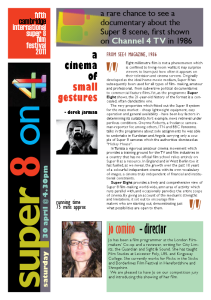 Originally developed as the ideal home movie medium, Super 8 has subsequently been used for all types of film- making, amateur and professional, from subversive political documentaries to commercial feature films.Yet, as the programme Super Eight shows, the 21-year-old history of the format is a concealed, often clandestine one. The very properties which fitted out the Super 8 system for the mass market – cheap lightweight equipment, easy operation and general availability – have been key factors in determining its suitability, fort example, news retrieval under perilous conditions. Gwynne Roberts, a freelance cameraman- reporter for, among others, ITN and BBC Panorama, talks in the programme about solo assignments he was able to undertake in Kurdistan and Angola carrying only a couple of Super 8 cameras which the authorities dismissed as “Mickey Mouse”. In Tunisia a vigorous amateur cinema movement which provides a training ground for the TV and film industries in a country that has no official film school relies entirely on Super 8 as a resource. In England and in West Berlin too it has fuelled, as we reveal, the growth over the past 10 years of a colourful independent cinema with its own vocabulary of images, a cinema truly independent of financial and institutional constraints. Super Eight provides a lively and comprehensive view of Super 8 film-making world-wide, amn area of activity which runs parallel with, and occasionally parodies the entire scope of cinema. By giving an account of the medium’s strengths and limitations, it set out to encourage filmmakers who are starting out, demonstrating just what possibilities are open to them.